(Newser) – With wolves coming off federal assistance, they will soon become prey again—so officials, hunters, and wildlife activists are sniping at each other before the hunt begins, the Washington Post reports. "It’s hard to fathom that you can be deserving of federal protection under the Endangered Species Act on September 30 and on October 1 be open fire," says an activist. But officials say wolf-hunting is necessary now that America's wolf population has grown to roughly 6,000 (plus thousands more in Alaska) after 39 years as an endangered species. Why did the Gov't spend 10yrs & tons of $$$ bringing back these animals just to have them hunted like vermin? Remember the Passenger Pigeon before you start pulling triggers again. If the species is no longer endangered, then there is no reason it shouldn't be hunted. If you don't like hunting, don't hunt. You have that right. I don't hunt but anti-hunters do amuse me. Do they think that package of hamburger in the grocery store was grown in a vat? 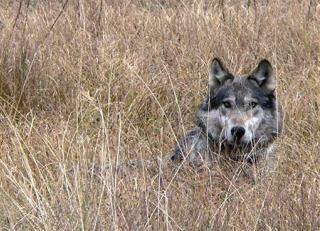 I am sure that if I were a rancher losing calves the majesty of the wolf would be lost on me.